A limited edition of 500 guitars made by Gibson in 2010 to commemorate what would have been John Lennon’s 70th birthday. 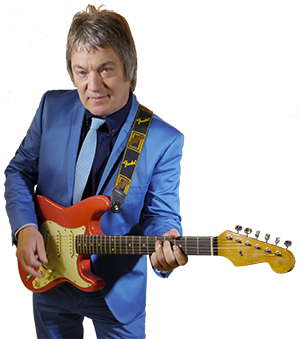 Made to the same specification as the 1962 guitars bought by John Lennon & George Harrison when they first got their recording contract with Parlophone. This re-issue features John Lennon’s birthdate inlayed in mother of pearl at the 12th fret and his signature on the headstock. The only guitar to feature on every Beatles album, they used them both as an electric with the inbuilt P90 pickup and also with a mic as an acoustic, sometimes both at the same time. A really unique instrument that breaks all the rules of a quality made acoustic by having the top made of plywood to help reduce feedback, plus an adjustable bridge saddle made from ceramic. (Another no-no). All in all it sounds like no other – just listen to those Beatles’ records! Retails at a whopping $4,750. Strings: Pyramid Gold Flatwound. 010-0465w gauge. George Harrison’s 3rd Gretsch guitar and bought to replace his Country Gent. Although a cheaper model, George preferred the sound of this guitar and it was first used on the Beatles For Sale LP in 1964. 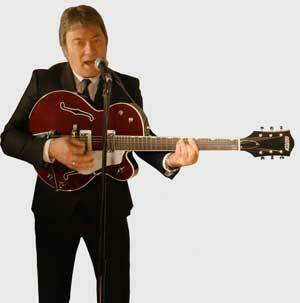 Called a Tennessean back then, George’s was a 1963 model and Gerry Marsden already used a 1962 model. Now hand made in Japan by Fender, Mel’s 2006 model was the first year to get the Chet Atkins signature back on the scratch plate since the 1970’s thanks to a new endorsement agreement with the Atkins family. 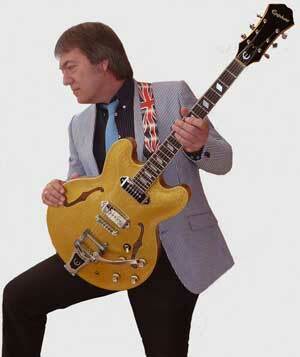 That had been lost in 1978 when Atkins moved over to Gibson guitars. Three versions are now made: the George Harrison spec 1962HT with Hi-Lo’Tron pickups, the 1962FT with Filter’Tron pickups and a G6119 deep bodied version, also with Filtertron pickups and real f-holes. Both the other models feature painted-on F-holes to help reduce feedback. The Getsch has a sound of its own that really nails The Mersey Beat Sound. Strings: Dean Markley Blue Steel. 011-052w gauge. Built in January 2014 by Angela Arnott at 42nd Street Guitars for Mel and based on a 1961 Fender Stratocaster. Alder body finished in Fiesta Red nitrocellulose lacquer. The rosewood neck has a flatter 12” radius with medium jumbo frets. Hardware parts are 42nd Street with a mint green scratch plate. The pickups, handmade in the UK, are a Bare Knuckle ’59 set, ideally matched for the slab board rosewood neck on this guitar. Mel has added an EMG SPC boost circuit and wired the master tone to all 3 pickups. This guitar replaced the Brinsley Schwartz custom built Strat that Mel used on stage from 1992! A very versatile guitar that can cover everything from The Shadows Apache, through the surf sounds of The Beach Boys to the gusty Rhythm n’ Blues solos. First introduced in 1962, Paul McCartney bought his Casino in late 1964. (Used on the solo on Ticket to Ride). Paul McCartney has later said that the Casino is his all-time favourite electric guitar and has continued to use it both for recording and live performances right up until the present day. George Harrison and John Lennon got theirs early in 1966 with Lennon using his almost exclusively until the Beatles broke up in 1970. All these Casinos were finished in Vintage sunburst and used on Paperback Writer and the Revolver sessions and also The Beatles 1966 US tour which was to be their last ever. In 1968 Lennon got his Casino sanded down to a neutral blonde finish which he used on Revolution and the last ever roof top appearance by the Beatles. 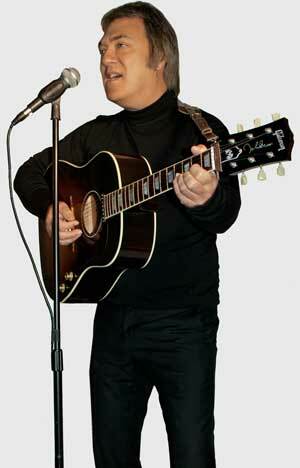 Epiphone, owned by Gibson from 1957 are now making two limited editions of the model owned by John Lennon. A ‘1965 Sunburst’ and a ‘1968 Revolution’ model in the sanded down finish. These are fetching over $3,500. Mel had his Epiphone Casino imported from Ohio US in January 2005. It is a 1997 guitar finished in a very unusual Gold Sparkle finish made by Epiphone for 1 year only and never made to sell here in the UK. The factory fitted Bigsby style tremolo arm adds to the rarity of this guitar. Since getting the guitar Mel has replaced the stock pickups with Kent Armstrong hand wound P90’s. The warm sound of this hollow body guitar adds originality to the later sixties songs. Strings: Dean Markley Blue Steel. 010-046w gauge. Bought new in 1998 to replace Mels Jetglo (Black) 360 12 string stolen from a gig! This is a limited edition model made from 1988 until 2000. This was made to be exactly the same as the guitar used by George Harrison back in 1964. 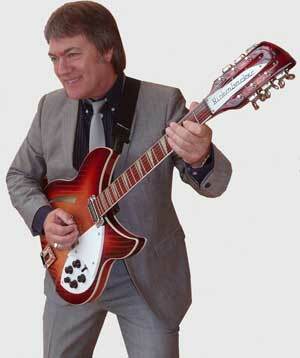 This Rickenbacker was used extensively on the Hard Days Night Album including the famous first chord of the title song. It was originally made this shape for only 1 year before being changed to the shape used later by Roger McGuinn of the Byrd’s. McGuinn’s model was called a 370 and had three of the original Rickenbacker ‘Toaster’ pickups. A limited edition Roger McGuinn edition has been made by Rickenbacker which incorporates a compressor circuitry to emulate the Byrds sound. Mel uses the unmistakable 12 string sound of this guitar on songs from The Beatles, The Byrd’s, The Searchers, Gerry & The Pacemakers etc. 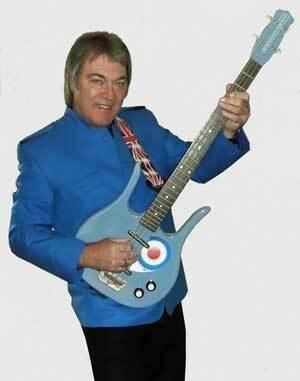 A new version is currently made by Rickenbacker called a 360 C63 12 string. Mel’s guitar has a replacement Ultratone brass and Delrin 12 saddle bridge from Ed Roman’s Guitar Store, Las Vegas. Strings: Pyramid Gold Flatwound 12 string. 010-0465w gauge. A new re-issue of the famous Longhorn guitars first built from 1959 to 1969. Originally offered in 3 forms: 4 string bass, 6 string baritone and a 6 string ‘Guitarlin’ version. This had 31 frets so playing the top end frets sounded like an electric mandolin. Never an expensive brand, Danelectro also built models for catalogue brands such as Sears & Coral. Most of the range featured the ‘lipstick’ style pickups that were originally just that. Lipstick tubes that were chromed and the pickup magnets taped inside. The guitar bodies were constructed with a poplar wood frame and the top and back of the body was made of ‘Masonite’ fibre board glued to the frame. The nut on the guitar was made of aluminium. Despite the cheap method of construction these guitars have a distinctive metallic sound that was featured on many late 50’s instrumentals. In 2008 Mel converted the guitar to a baritone using a 1990’s ‘new old stock’ neck. Tuned a perfect 4th below a guitar Mel uses it to great effect playing rock and roll hits by Duane Eddy and Jet Harris, also featuring the late 60’s country hits from Glen Campbell. Strings: D’addario XL157. 014-068w gauge. Built with the same construction as the other guitars in the Longhorn range, the bass version offers the same very light body with a short scale bass neck making it easy to play for a ‘guitar’ player. Played in the 60’s by John Entwistle of The Who. When John broke strings by his heavy bass soloing he found the light, short scale strings were not available in this country. The answer? Buy a new Longhorn Bass very time you have a broken string! Tom Petty brought them back into fashion in the late 1980’s by playing one in the Travelling Wilburys. Mel’s is a 1998 re-issue. Strings: D’addario XL170s. .045-100 gauge. Unlike other Danelectros made since the 1990’s, the Hodad is not a reissue of an older model. Made in limited numbers from 1999 to 2001 they were sold as ‘The Ultimate Surf Guitar’. (Hodad is a slang word for a surfer). These guitars had a body shape based on the Mosrite guitars used by The Ventures back in the 60’s. The body construction was the usual Danelectro poplar wood frame and Masonite (hardboard) top and back. This top of the range model featured 4 lipstick single coil pickups wired as 2 humbuckers. These could be coil tapped or used out of phase by pulling up the tone controls. Finished in a range of metallic and sparkle finishes, Mel’s 1999 Hodad is a light blue Sparkle model fitted with a Danelectro Bigsby style tremolo arm. Never sold in the UK Mel imported this rare guitar from Massachusetts in January 2008. 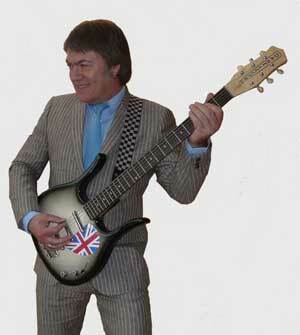 A replica of the guitar made famous back in the 60’s by The Rolling Stones’ Brian Jones. The neck and body are made by Alan Entwistle (Alden Guitars). The neck pickup is an Entwistle Alinco single coil and the bridge pickup is a Seymour Duncan SSL-5 Custom. The Brian Jones style mirror pickguard and the reproduction alloy control knobs were made by Phantom Guitar Works in the USA. PGW now owns all the trademarks for the body shapes, headstocks and names such as: Phantom and Teardrop etc. Currently drop tuned to D for slide playing. Strings: Pyramid Gold Flatwound. 012-054w gauge. CUSTOM QUALITY ELECTRIC UKULELE, Tin!!! “Everyone should play a ‘uke’. It’s so simple to carry with you and it’s one instrument you can’t play and not laugh!” – George Harrison. 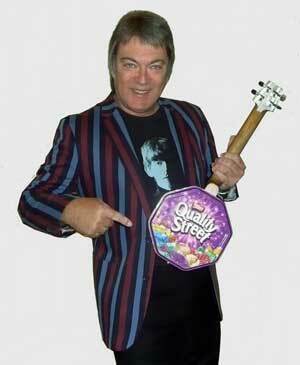 Mel’s ukulele was custom built using a Quality Street Tin! Hand made with a through the body neck and an under bridge Piezo pick-up with onboard eq. It is concert size and tuned to C (gcea). 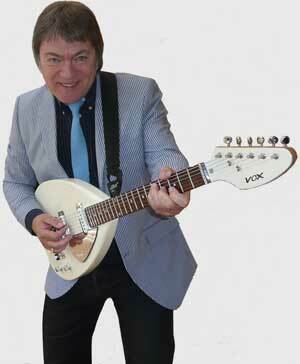 Mel plays it to recreate those early 60’s hits by Joe Brown. Also the Paul McCartney/Eric Clapton version of ‘Something’ – as featured at the George Harrison Memorial Concert of 2002. 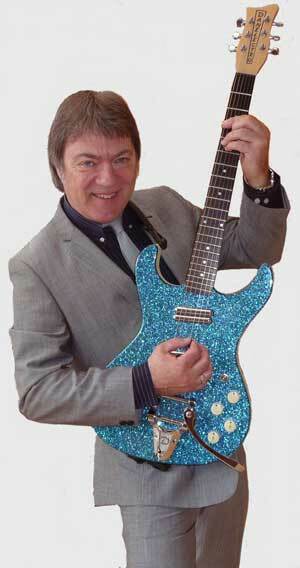 Joe Brown’s version of ‘I’ll See You In My Dreams’ often ends the night. Strings: Aquila Nylgut Medium Tension.